Solar supporters are stronger together! We’re excited to report recent success on two fronts: protecting net metering in Virginia and fighting higher fixed utility charges. This is proof that when solar supporters stand-up and fight together, good things happen! The Rubin Group is meant to be a collection of energy stakeholders tasked with building consensus on solar policy recommendations to the Virginia General Assembly. Last year, the group’s discussions yielded three solar-related bills that were ultimately signed into law. This year, engaged solar supporters from across the Commonwealth changed the conversation. Dozens of solar homeowners participated in in-person meetings and phone calls, clearly staking out the position that any policies affecting rooftop solar must be substantiated with data while also accurately valuing its many benefits. Due to pressure from solar supporters, the Rubin Group did not make any recommendations to change net metering policy. In fact, when Virginia’s monopoly utilities and electric cooperatives proposed policy recommendations targeting their solar customers with higher fixed charges and reduced net metering credits, we challenged them to prove why this was necessary. Our efforts succeeded as the utilities could not provide any data to back up their claims—and the principal recommendation out of the Rubin group was the need for “better data collection and analysis” to inform future discussions about net metering policy. This is a victory and reminder that the utility strategy of ignoring the benefits of rooftop solar while targeting their solar-producing customers with unfair and discriminatory policies will no longer be acceptable. When the Rappahannock Electric Cooperative (REC), Virginia’s fourth largest electric utility, sought to double fixed access charges earlier this year, it didn’t receive much media attention. But recognizing that a higher fixed charge would make rooftop solar less attractive while also disproportionately impacting low- and moderate-income rate payers, our community mobilized to act. Member-owners, including nearly 100 Solar United Neighbors supporters, flooded the REC board with their comments and concerns. Ultimately, REC backed down from its initial request, instead reaching a settlement with the Sierra Club and the Office of the Attorney General that only raised rates by $4 and promised future steps to notify more members in advance before making further rate increases. Apart from the rate increase, many REC member-owners remain concerned about the cooperative’s lack of transparency and slow progress in encouraging more solar options. These two recent victories show that our growing community of solar supports has real power. Will you help us as we continue to grow and fight for the clean, healthy, and democratized energy system Virginians deserve? The political landscape in Virginia is shifting. At least 13 Delegates elected to the General Assembly in this month’s election refused to accept contributions from Dominion Energy and Appalachian Power, Virginia’s two largest utilities and two of the most powerful political actors in the state. Most importantly, our constituency of solar supporters and homeowners continues to grow, organize, and mobilize to change the rules of our energy system—rules rigged in favor of the utility monopolies for far too long. These factors create an opportunity for an engaged solar community to help direct Virginia’s energy future. Good things happen when we join together to fight for our energy rights. And the results in other states where solar supporters fail to organize and mobilize in the face of corporate interests paint a disheartening picture. Our coalition is diverse politically and geographically, but we’re tied together by a desire to build a locally controlled energy system that produces clean, healthy, and reliable electricity, creates jobs, and benefits communities around the Commonwealth. Distributed solar is at the cornerstone of this vision for the democratized energy grid of the future, and we don’t like utility monopolies standing in our way to protect their profits and outdated ways of doing business. 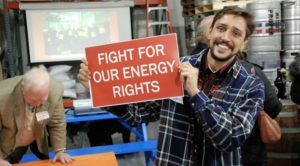 You can take action today by signing our Virginia Declaration of Solar Rights, becoming a member of Solar United Neighbors, or by going solar. You can also find your legislator and let them know that you support solar rights over utility monopoly profits. With your help, the solar policy wins of 2017 are just the beginning!